Anyone get the feeling that Apple is trying to consign the optical disc to an early death? The latest Mac Mini comes with no optical drive included, while its latest revision of OS X – Lion – can only be bought pre-loaded or as a 4GB download from the Apple Store. Lion then installs its recovery files to a hidden partition on your hard drive – these files don’t include the full Lion installer, which then has to be downloaded again over your wi-fi or wired network. If your hard drive physically fails, then you’re covered if you bought your Mac pre-loaded with Lion, as it has built-in capabilities to get online to recover the recovery partition (and subsequently the Lion installer files if you’re installing from scratch as opposed to recovering a Time Machine backup). If you bought OS X Lion as an upgrade through the App Store, however, your sole option – until now – was less palatable: install Snow Leopard from the disc, update it to 10.6.8 and then download the whole lot again. Thankfully, Apple has seen the light and realised that this convoluted process is asking too much of upgraders. 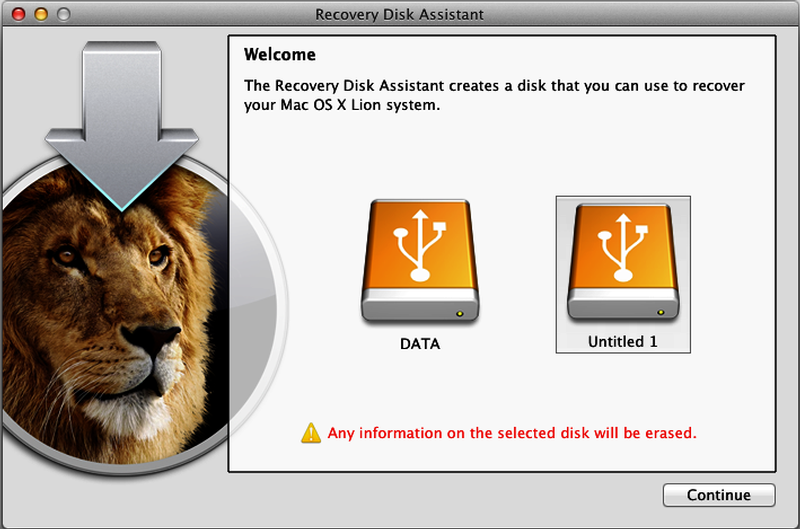 The end result is this: the Lion Recovery Disk Assistant. It runs on any Mac running OS X Lion with an existing recovery partition – all you then need is a USB disk – hard drive partition or thumb drive – with 1GB free space. Plug it in, launch the utility, pick your chosen drive and click Continue to create the disk. Note that if you want to use the drive for uses other than a pure recovery disk, you’ll need to create a 1GB partition on the drive using Disk Utility first – see this Apple KB article for details. Once done, you’ll be able to recover Lion to a brand new hard drive without having to go through the whole palaver of installing Snow Leopard first. Once the new, hidden recovery partition has been created the drive is ready for use. Should you ever need it, reboot your Mac with the drive plugged in, then hold down the [Option] key and select Recovery HD from the Startup Manager. You’ll then have access to all the usual recovery options: reinstall Lion, Disk Utility, restore from a Time Machine backup and browse the web with Safari.